Seeing Santa Claus can be a challenging task for any child. I have several pictures of myself with Santa when I was younger- and in all of them I’m either crying or wiping up tears. For autistic children, seeing Santa Claus can be a downright nightmare. Both for the parents and the child. In fact, Sweet B stopped seeing Santa Claus after she turned 5. Even at school, she just did not like dealing with Santa. It just wasn’t worth the struggle or the meltdown that came with it. But is there a way to make it easier? 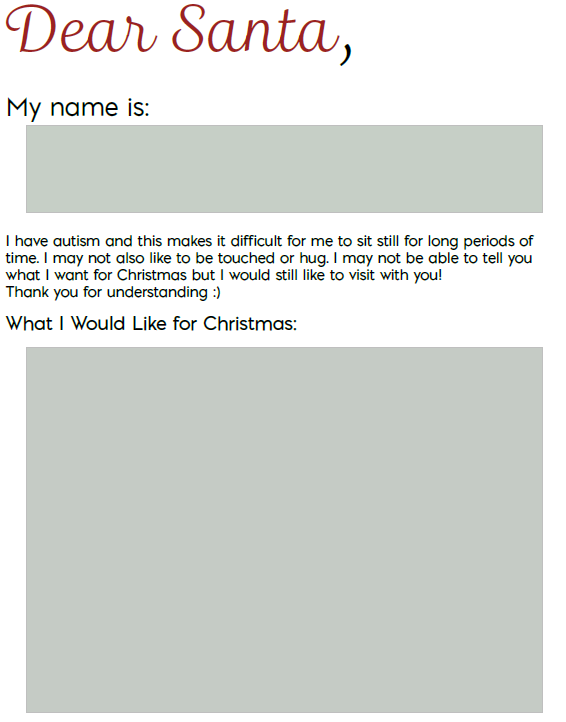 Here are some tips and advice, along with a free printable letter, for how to help your autistic child with Santa. And if you’re looking for help for Halloween, be sure to check out my Trick or Treat cards on the free printables for autistic children page. 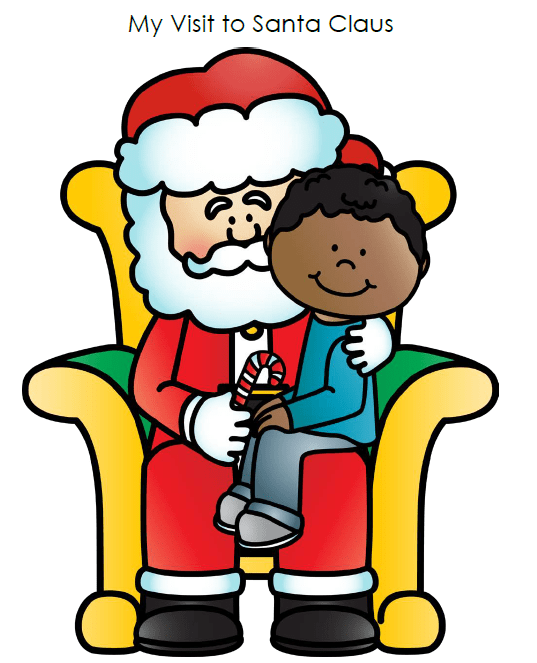 Depending on where you live, you may be able to visit Caring Santa; sponsored in part by Autism Speaks. Or you might get lucky and have a Santa Claus at your local mall who’s understanding to special needs. But, if you aren’t, here are a few tips (from experience) that I used in the past to help Sweet B with Santa. Go during the week, if you can, to avoid the potentially long lines. Waiting and patience was never a strong point for my daughter. And to be perfectly honest, my patience has never been up there either. Waiting also leads to increased chances for a meltdown. Dress your child comfortably. Yes, I realize that pictures with Santa are meant to be special. And maybe Grandma just wants to see her grandchild in that special holiday outfit. However, that new sparkly holiday outfit just may be too much. Keep this in mind and explain accordingly. Ask your child’s speech therapist or social worker if they have an appropriate social story. Chances are likely that they do. This may help ease your child’s anxiety about visiting Santa Claus. Obviously, you know your child best. Watch for those triggers or signs that a meltdown is approaching. And if one does happen, that’s okay. Just be a little prepared for handling that public meltdown. If your child is non-verbal, be ready to go up to see Santa Claus with them so you can communicate. You may even have to sit with Santa Claus so your child feels more comfortable. 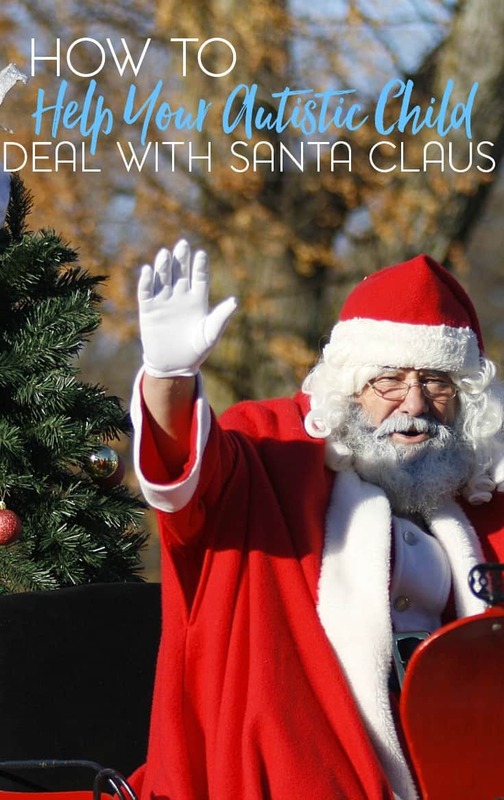 My free printable “My visit to Santa Claus” cards might help, too. This small pack has cards illustrating a child waiting to see Santa. Need another help for visiting Santa Claus? I’ve prepared two printable letters that you can take with you. One is geared towards children with autism while the other is for children with sensory processing needs. You can either have your child hand this to Santa Claus or you can give it to Santa or one of his helpers ahead of time. Whatever the case may be, I hope that you find this printable letter to be of use! Do you take your autistic child to see Santa Claus? 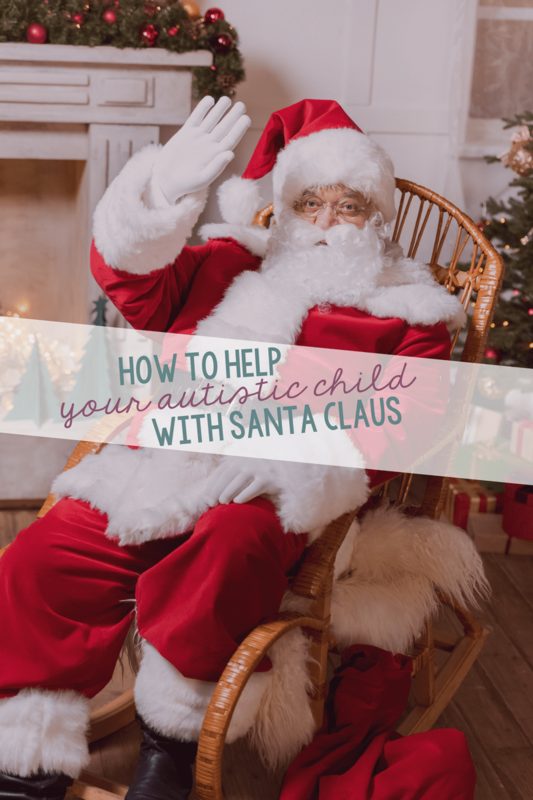 What tips or advice would you share with how to help your autistic child with Santa?